(Nanowerk News) For most people, frustration is a condition to be avoided. But for scientists studying certain "frustrated" ensembles of interacting components – that is, those which cannot settle into a state that minimizes each interaction – it may be the key to understanding a host of puzzling phenomena that affect systems from neural networks and social structures to protein folding and magnetism. 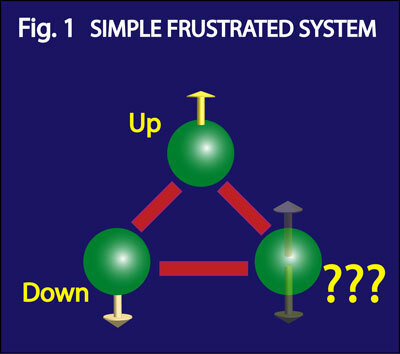 Frustration has typically been extremely difficult to study because even systems with relatively few components have interactions so complex that they cannot be modeled effectively on the best conventional electronic computers. Now, however, a team of researchers has simulated frustration in the smallest possible quantum system in a precisely controllable experimental arrangement, one which can be extended to much larger systems. In addition, they have demonstrated for the first time how frustration is related to a bizarre but highly useful quantum-mechanical condition called "entanglement." 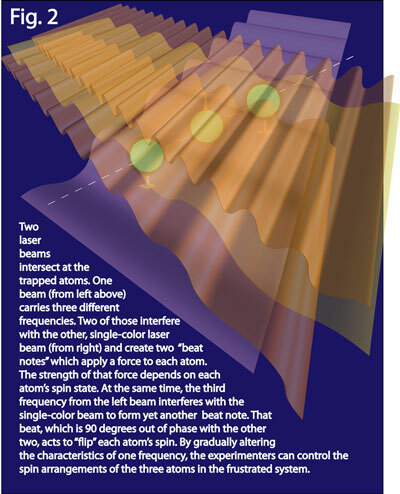 They report their findings in the June 3, 2010 issue of the journal Nature ("Quantum simulation of frustrated Ising spins with trapped ions"). "Frustration occurs when one or more elements of a system are acted on by competing forces in a way that makes it impossible to reach one 'ground' state, or lowest-energy arrangement, of all individual interactions," says research group leader Chris Monroe of the Joint Quantum Institute (JQI). "The simplest example is a system of three objects such as atoms, each of which has a spin" (the quantum-mechanical analogue of north or south magnetic poles) "that can have only one of two values – either 'up' or 'down' – and nothing in between." For any two such objects, the minimal-energy condition occurs when the spin of each object is the opposite of its neighbor. [See Figure 1.] So if there are only two objects, each with an opposite spin, the system naturally tends to be in this state. But add a third object and things get interesting. This third object has two neighbors, each with a different spin. It cannot line up opposite to both of them. So it is stuck between two alternatives, each of which is equally unsatisfactory and each of which requires the same amount of energy. That is the condition called frustration. Researchers are intensely interested in that phenomenon, which can provide key insights into the way objects arrange themselves into materials such as the crystals used in electronics, or the rules that govern the way that large, complicated protein molecules coil themselves up into their distinctive shapes. Important open questions include: How do such systems evolve in time? What if the objects are quantum systems? And can the interactions among the different parts be manipulated by changing certain variables? 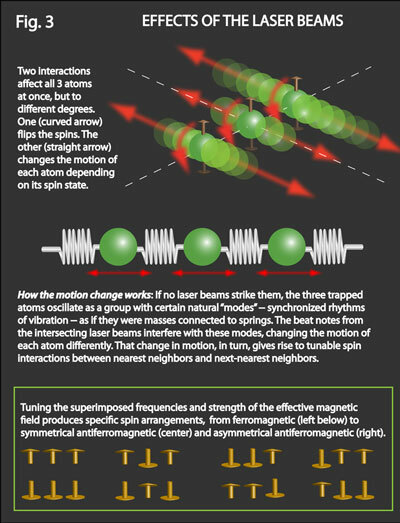 Monroe's team set out to investigate those questions by creating a fully controllable version of the smallest possible frustrated magnetic network, consisting of three spins. They trapped three atoms of ytterbium, a metallic element a little lighter than gold, in a vacuum chamber and aligned them so that the atoms lined up side by side like beads on a string. [See Figure 2.] Any three-object quantum system of this kind, in which each object can only be in one or the other of two states, will have eight possible variations. For example, three coins flipped simultaneously can yield all heads, all tails or six different combinations in between. The goal of the JQI researchers was to find out what set of conditions produced each of those eight combinations on demand. They did it by aiming two separate laser beams (traveling at right angles to one another) which intersected at the point where they hit the atoms. One beam consisted of a single frequency; the other had two additional frequencies superimposed on the laser carrier beam. Where the beams intersected, the various frequencies would alternately cancel and reinforce one another, creating a pattern of multiple "beat notes." By carefully tuning the relative strengths of the laser beams and the time intervals over which they were applied, the researchers learned how to produce any particular pattern of spins. As a result, Monroe explains, "we have exquisite control over all aspects of this interacting system of three magnetic spins. We can make them ferromagnetic (wanting to align their 'north' poles the same way) or antiferromagnetic (wanting to align in opposite directions), and we can control the relative strengths of the three interactions. What's most exciting is that we can scale this system up to many more spins – perhaps 100 or more – using almost exactly the same apparatus. By controlling these magnetic interactions with only 25 (or so) spins, we can create states that cannot be modeled with any conventional computer. What we have is a restricted type of quantum computer called a 'quantum simulator,' that was first proposed by Richard Feynman in the early 1980s." (see Feynman's proposal here; pdf). In addition, the team showed for the first time how frustration is related to a quantum-mechanical condition called entanglement, in which the states of two or more objects become so inextricably connected that none of them can be described separately. So even when two entangled objects are separated by millions of miles, as soon as the state of one is measured, the state of the other is instantly known. This condition is so unlike the way that things behave in classical physics that some of the originators of quantum mechanics – notably including Albert Einstein himself – doubted that it was true. He and two colleagues wrote a celebrated journal article in 1935 arguing that the notion of entanglement was wrong. But decades of experimental evidence since then have demonstrated its existence in objects such as pairs of photons or pairs of atoms. Indeed, generating and characterizing entanglement between two objects is now a familiar staple of quantum science. But entanglement among three or more objects is less studied and only partly understood. Frustration, the JQI researchers determined, provides a pathway to many-object entanglement. Because frustrated systems do not have a single lowest-energy state, their components take on a variety of different arrangements each of which is at the same energy level. Quantum theory predicts that when the objects in a system exist in a superposition of these arrangements, embodying multiple states simultaneously, they become entangled. By carefully measuring the distribution of different arrangements of the ion spins, the scientists were able to show the link between frustration and entanglement. Their results are chiefly significant for basic science; but the work may also have practical consequences. Any eventual quantum computer will almost certainly rely on entanglement to create and transfer connections among information units during data processing. "Entanglement is a concept that is at the heart of the strangest features of quantum mechanics," Monroe says, "and it is easy to come up with simple examples of entanglement, say between two interacting spins. This is basically what Einstein did in 1935 in trying to show that quantum physics was just too weird to be right. But entanglement between lots of particles is a murky concept -- there's not even a unique way to quantify entanglement in big systems." "For a huge amount of spins, like in a macroscopic magnetic material, there are very strange states where the spins form 'domains.' And even at zero temperature there can be a great deal of randomness (entropy) in the alignment of those spins. This is related to the fact that the spins can be frustrated. And with so many compromises, there are many possible spin configurations." "In our experiment, we make a clear connection between frustration and how it leads to an extra degree of entanglement, in the smallest possible system of three spins."